There is an old saying: the way we worship, the way we pray, shows what we believe. (The Latin is Lex orandi, lex credendi. Impress your friends.) As Anglicans, we know this is true. The best and truest expression of our theology is the way we worship together. And our order and pattern of worship is found in the Book of Common Prayer. Archbishop Thomas Cranmer penned the first Book of Common Prayer, adapting and translating from the ancient Latin liturgy of the Church. In his preface, he explained this book’s key principles: the centrality of Scripture, respect for the traditions of the early Church, simplicity, beauty and good order. Those same characteristics define our worship today. It is rich in the words and images of Scripture. It follows the pattern of Christian worship that God’s people have used since the early centuries of the faith. It is orderly. It is elegant. And it is very beautiful. The classic English Book of Common Prayer came out in 1662, and is still used in some places in England and elsewhere (available here). The most recent Prayer Book in the American tradition was published in 1979 (read it here). Since Pentecost Sunday, 2013, we have been using the ACNA liturgy for Sunday services. 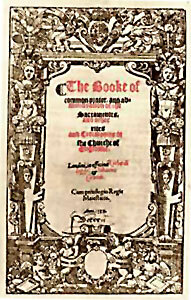 This is part of a much larger project: the Anglican Church in North America is preparing a whole new revision of the Book of Common Prayer, continuing in the tradition we have received, bringing the classic language of Thomas Cranmer into modern English, showing forth what we believe as we “worship the Lord in the beauty of holiness” (Psalm 96:9).